Welcome to "Little Bits Of Whimsy Clips" snowman edition. 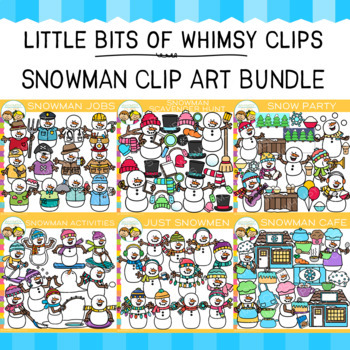 "Little Bits of Whimsy Clips" will contain 6 sets. All images are 300dpi transparent png. This bundle is now complete. Smart Board and PowerPoint uses are fine in commercial products as long as the image is flattened as part of a background and not loose in the file. Personal classroom use: The images may be used in lessons, activities, SMART board or PowerPoint lessons/activities that are not distributed or sold. Commercial credit is required: A link to Whimsy Clips is required in both commercial products and freebies. You can link back with either a text link or a logo that's included in the zip file. Internet/Web Site/Blog Usage and Design: Images may not be displayed in blog posts, on websites, or anywhere on the Internet in their original form. ** If you have any questions please feel free to contact me. Thank you so much! Original Illustrations © Whimsy Clips L.L.C.